Honoring all our local Olympians who represent Ski Town USA ® on the world stage. Located on the second floor of Thunderhead Lodge (upper gondola building) at the Steamboat Ski Area. Steamboat Springs’ Olympic tradition is second to none. Boasting more winter Olympic athletes than any other town in North American, our Olympic heritage runs strong and deep. 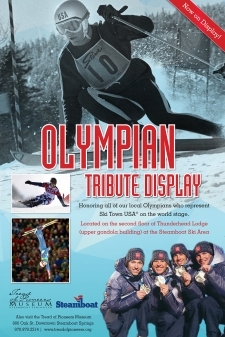 To honor all of our local Olympians who represent Ski Town USA® on the world stage, the Tread of Pioneers Museum and the Steamboat Ski Resort have partnered to produce an Olympian tribute display on the second floor of Thunderhead (upper gondola building) at the Steamboat Ski Area. The exhibit was made possible through a generous donation from the Duffey family in honor of Ed and Jayne Hill. The exhibit tells the story of the competitive spirit and quest for excellence that began with Norwegian ski jumper, Carl Howelsen and continues to inspire our athletes today.